Global Warming  If greenhouse gases are bad, how come CO2 increases agricultural productivity? If greenhouse gases are bad, how come rising CO2 levels increase agricultural productivity? What about greenhouse gases? Plenty of evidence from numerous studies indicates that the Earth has far more capacity to absorb greenhouse gases than the IPCC gives it credit for, many times more, and that additional CO2 will actually be beneficial to farming, both in the quantity and the quality of crops that can be raised. Dr. Landscheidt identified in his report that the atmospheric CO2 concentrations appear to follow with a six month time lag variations in solar activity and corresponding temperature variations. That would indicate that increases in CO2 concentration are caused by atmospheric warming resulting from solar activity, not that increases in the CO2 content of the atmosphere cause warming (or the heating-up of the sun). With warmer weather the sea water warms up. When that happens, CO2 is released by the sea water. Try it sometimes with two glasses of pop. Put one in a pot of water and warm it up a bit. Put the other in the fridge. When the pop in the warm water bath has no more fizz left, check the one in the fridge to see whether it still has any. Moreover, when the climate warms up, plants absorb more CO2, grow better and therefore produce more oxygen. However, none of that matters to the IPCC, Suzuki and cohorts. 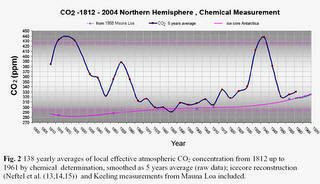 Never mind that in the past, CO2 levels in the atmosphere have at times been 20 times or more than what they are now. That those levels were much higher than now is a good thing, or else we would not have any coal to burn now, most likely no oil either. Would that be good? Maybe, if we want to return to the way of life our great-grandparents led. Then we would have to walk through the horse manure in the streets to pick up a pint or so of whale oil for our lamps, instead of ducking from the horse manure that is being launched at us with the help of the media, both in print and on TV. It is no accident that the geological record shows that all ice ages happened during periods of low solar activity, while the intermediate warmer periods between ice ages happened during periods of high solar activity. The notion of low pre-industrial CO2 atmospheric level, based on such poor knowledge, became a widely accepted Holy Grail of climate warming models. The modelers ignored the evidence from direct measurements of CO2 in atmospheric air indicating that in 19th century its average concentration was 335 ppmv (Figure 2). In Figure 2 encircled values show a biased selection of data used to demonstrate that in 19th century atmosphere the CO2 level was 292 ppmv. A study of stomatal frequency in fossil leaves from Holocene lake deposits in Denmark, showing that 9400 years ago CO2 atmospheric level was 333 ppmv, and 9600 years ago 348 ppmv, falsify the concept of stabilized and low CO2 air concentration until the advent of industrial revolution . The March 19, 2007 statement by Dr. Zbigniew Jaworowsky was expanded by him in an article titled "CO2: The Greatest Scientific Scandal of Our Time" (Spring/Summer 2007, pp.14 - 28, 21st CENTURY Science & Technology; 444 kB PDF file). The report (short version) by Ernst-George Beck presents the following comparison between actual measurements of atmospheric CO2 levels and the values presented by the IPCC. Note: Ferdinand Engelbeen has justified and somewhat serious reservations about the compilation by Ernst Beck. He argues that in all likelihood only the minimum values compiled by Ernst Beck should have been used and that those do not vary much from the values measured in ice cores.